Loving the leopard print and stripes trend. I think a pop of burgundy with the bag adds a fall-ish touch. And hey, there are even a few leaves on the deck to add to the autumn vibe! Trying to get wild Rox to hold still and pose … hee. Hope all my dolls are having a fabulous weekend! 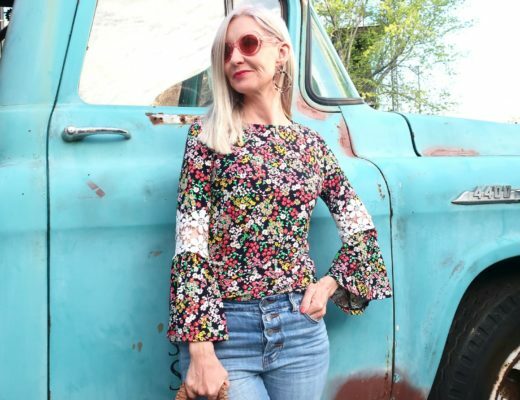 This week I’m being featured on Imogen’s fabulous Inside Out Style! Don’t forget to follow me on Bloglovin’! And like and follow my new FB page too! Visible Monday! Manic Monday! Mix it Monday! The Pleated Poppy! Random Wednesday! Throw Back Thursday! Tres-Chic Thursday! love this look! I like cheetah and stripes together, it's unexpected and different. I'm wearing distressed denim today too and it's so casual and perfect for a Saturday. I love your look today and I wish I was at Fashion Week too. I'll check that out. Thanks! Well, aren't you sweet? Thanks so much, Nancy! Fun! I love the leopard and the stripes together. Love the mixed prints! Cute outfit! Love the leopard and stripes together. 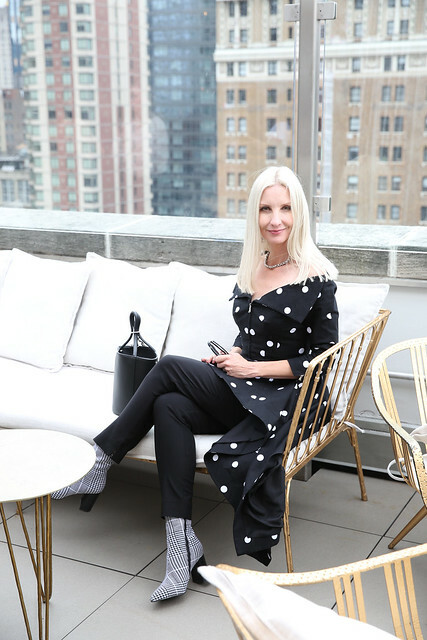 Oh Dawn, I'm thinking we must do NY Fashion week one of these years (together that is), but for your weekend attire, you sure know how to go about it in great fashion. Truly inspired me with your leopard and stripe, and I'm quite liking the idea of the added burgundy accent. Don't be surprised to find me trying this outfit next weekend. Hope you enjoyed your weekend with hubby and Rox. Let's go to NYWF one year together! How super fabulous and fun would that be?! Can't wait to see your take on this look. Your style is always amazing! Mixing prints is so fun! Your outfit looks awesome, casual yet stylish, perfect for a day off! I love the leaves on your deck, fall is the best! I love fall too! Thanks, Miriam! So pretty! 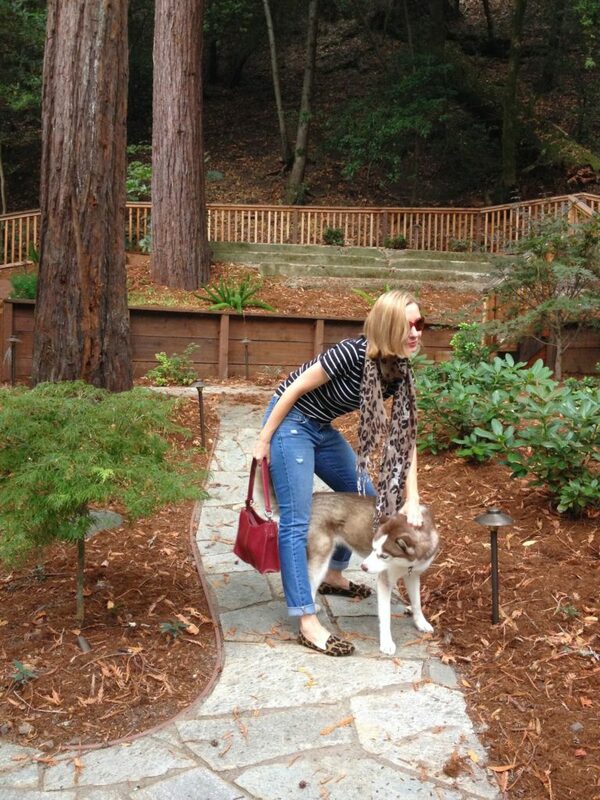 Love the stripes and leopard combo and your dog is beautiful! 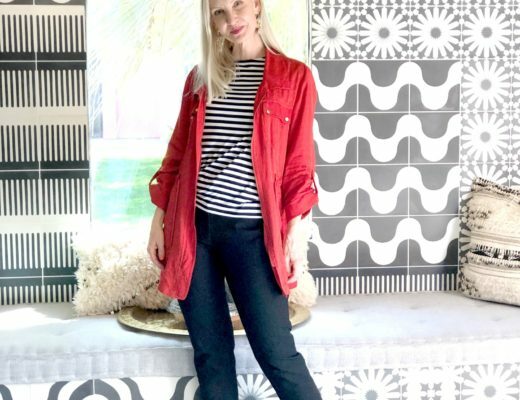 Great pattern mixing Dawn Lucy: a fun combo and cute shoes! Great fun look, Dawn Lucy. And what an adorable doggie. Thanks for sharing with Visible Monday, xox. 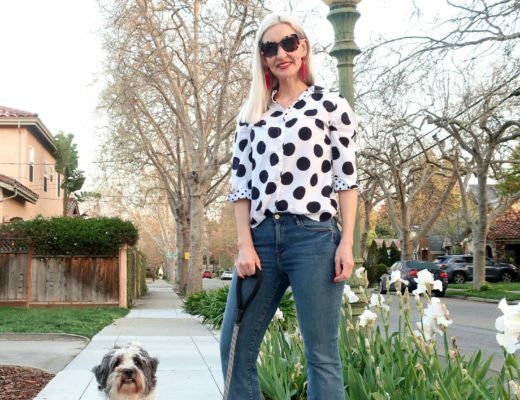 Love stripes and leopard and I love the photo bomb by your cute dog! Hello Dawn! Lovely as always. I should get on the stripes bandwgon. 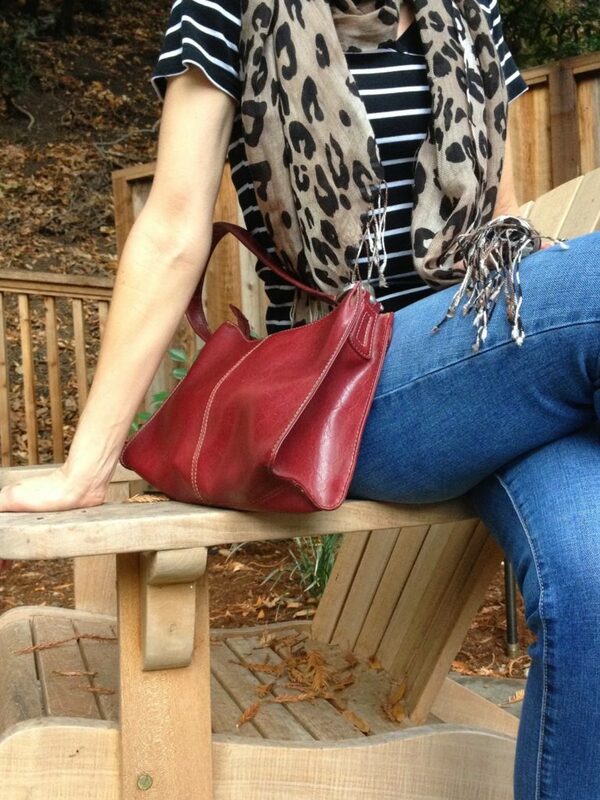 I do love this with the leopard touches, love your shoes, and the burgundy bag is perfect! I love this color for fall. Now you KNOW the first thing I'm going to say is what a beautiful doggie! They make for the best accessories, don't they? Please steal away! Doggies and fashion … aww … life IS good! well done for mixing prints so well. I love your scarf and fun shoes! Great look! Love those shoes! Thanks, Darcy! I bought those little leopard flats on a whim one day and now they've been favorites for years! 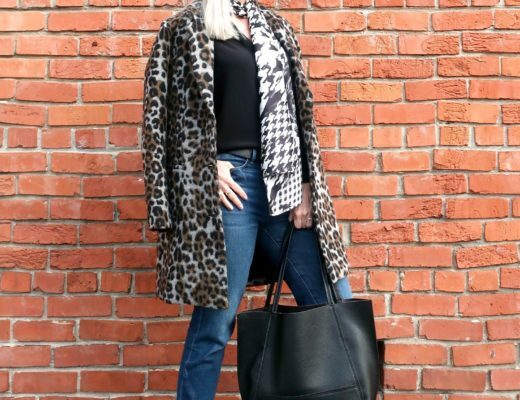 Leopard and stripes are just meant to be together. And the red…perfect touch! BTW, I am hosting my first link up this Thursday and hope that you join me. Aww. aren't huskies pretty? Rox is a ball of energy and an even bigger ball of LOVE! 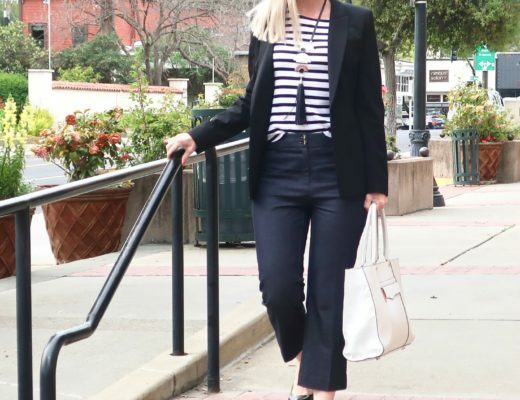 I really love how you styled your basics for such a fun look! It's amazing that a little accessory can add so much to a simple look! 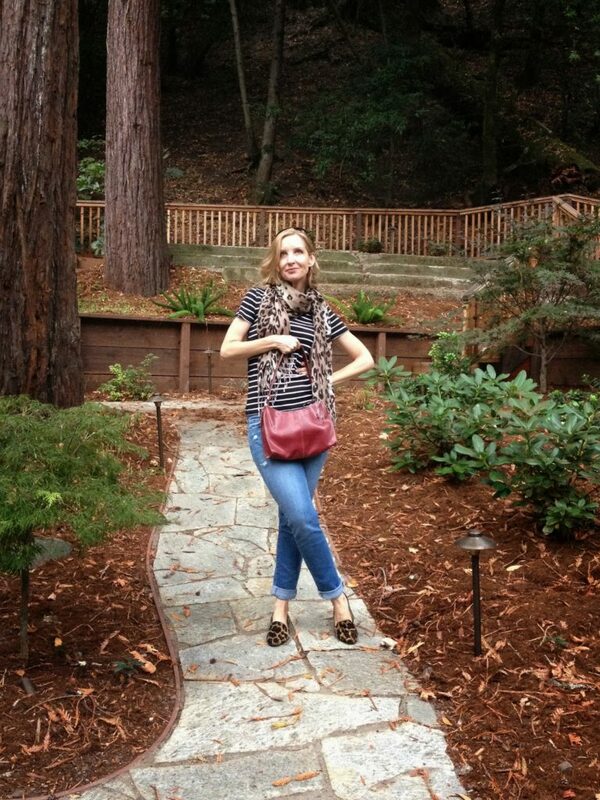 Love the leopard print scarf with the striped tee! One of my favourite combos too 🙂 Such a nice print mix! Thanks, Mica! She's my baby for sure! I'm a fan of leopard print too. Just a touch here and there usually a scarf or shoes. It just seems to add a touch of glamour to any outfit as you have shown here. Oh, a bet that puppy was adorable! Work is busy but good. Back to school night tonight! Thanks, Marta! I've had those leopard flats for a couple of years now and still love them! Mixed prints are my jam! Love this entire look! I love leopard scarves too! I only have 2 right now, but I could see myself buying more for sure! Love the pattern mixing and pop of burgundy! Perfect for adventuring with your fella! You just do this sleek chic on the casual side so well. This is one I could actally pull off, with only a few adjustments. Noted. And appreciated. Can't wait to see you wear this look, Beautiful! Also … meant "actually". I hate it when I see the spell check under-squiggle right after I hit "Publish." Leopard + stripes = fabulous!!! Its super fun and stylish just like you. Loving your blog!